Silly, surprising and entertaining best sums up this rendition of 60 minutes of history. Not that you could even seriously begin to tell the story of Florence in one hour. And yet. 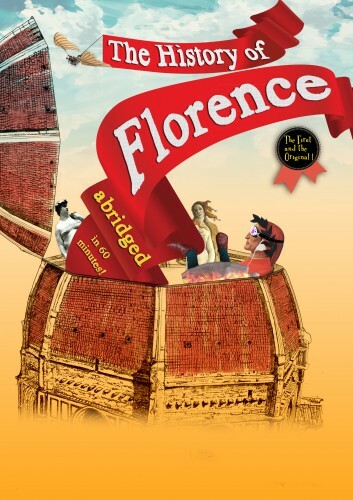 The History of Florence in 60 Minutes has created a memorable comedy / musical / sometime serious play, giving the more important highlights of last 2000 years in this part of the Italian peninsula a breath of fresh air. The show starts with sassy professoressa Celeste Bueno bursting into the theater, a room carved out of a genuine “palazzo” from the 1500’s. She begins with a no nonsense presentation which makes you question if you really did sign up for a course of three months. The humour begins subtly as you watch her deal with several obstacles – which turn out to be just all part of the ‘Italian’ experience. With a creative mix of fact, culture and laughter, she grudgingly makes use of her unplanned assistants (Roberto Andrioli and Fabrizio Checcacci) and proceeds to present Dante, Lorenzo, Michelangelo and Leonardo da Vinci using an odd assortment of props and … a bit of song and dance. It’s not like I can give the ending away (any tour guide or book can tell you how history plays out) … but then this production isn’t really about the story, rather it is about the delivery. But I hesitate to say too much and take away the fun of the humor. I had a few minutes to speak with actors, directors and play-writers Roberto Andrioli & Fabrizio Checcacci: “The difficulty was creating a story that would speak to many nationalities. We had to take into consideration that what’s funny in English, isn’t the same thing that’s funny in French.” And yet with my mixed cultural background, I can honestly say that I enjoyed each sparkling minute of the production. A creative mix of corny one liners combined with musical games and play on words are spot on, delivering an evening of laughter. It may not be a traditional timeline that plays out in front of you but, the three actors work together to underscore the select moments of Florentine history while giving life to a few of the more memorable personalities of this great city. Playing for the rest of September and all of October, this show is just the right touch of light hearted comedy to fill an early evening. 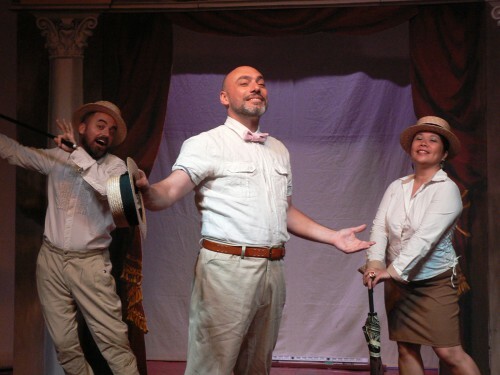 If you are looking to experience the rich cultural side of Florence – but see the language as a barrier, then rest assured: the English is totally comprehensible with a wide range of actors and nationalities (Matias Endrek, from Argentina and Bernard Vandal, from Canada also perform regularly.) This slice of theater is a lovely presentation of genuine Italian creativity. It starts early at 8:15 pm but finishes just in time for you to stroll the streets, grab a gelato and explore the squares, buildings and night lights with new eyes. Cost: Full €28, students (to age 25) €20, children under 12 are free with at least one adult, there are family tickets available. Combination dinner / theater packages available.